It's been one of those weeks where the workload just continues to pile on with no end in sight. Which isn't necessarily a bad thing - I'd certainly rather be busy than bored - but it's left me a little braindead in the evenings, with not much energy for thinking, writing, or staring at a computer screen. But I do like what I do, so even when it takes over a week or two, it's not so bad, after all. Because of this, though, this week featured a lot of link action and not a lot of original thought. On Monday, I featured Newsweek's article on that subject that just won't die: how e-books are changing the nature of reading. After an exhausting day at work on Tuesday, I spent far too long laughing away time on Tuesday evening while browsing Reasoning with Vampires, originally featured on The Book Lady's Blog, in which one intrepid blogger (who has actually read all of the Twilight books) parses out each book sentence by sentence, trying to make sense of the horrid writing that somehow went viral. I don't understand the popularity of the series (or certain other authors, either, for that matter), but the site is well worth a visit). I'm always intrigued by books adapted for the big screen (and I always read the book first), so the wealth of Grimm Fairy Tales hitting theaters this year and next caught my eye. Red Riding Hood and not one but two Snow White adaptations? Sign me up. But first, I have to check out the highly-recommended Maria Tatar editions of the original tales, according to commenters. Just more proof that despite our laments, movies really aren't ruining the books (as this t-shirt proclaims). I did get one review up this week: Bending Toward the Sun, a mother-daughter memoir about a Holocaust survivor and the inheritance of trauma. Not my standard reading material, but it was good to get out of my comfort zone a bit. Stay tuned for a review of 13 Rue Therese this week, and a recap of the first e-book I'll ever finish on my Sony Reader: Enough About Love. Both novels are very French, very Parisian, full of adultery, and make me very glad I have the husband I have. More to come on those. 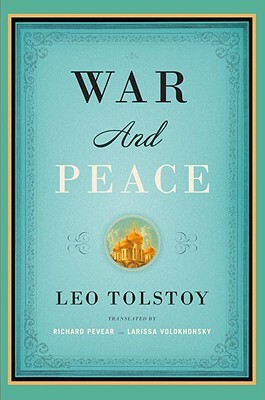 And lastly, my brand-spankin' new edition of War and Peace came in the mail this week, marking my official start of the War and Peace read-a-long (only a few weeks late). I'm hoping to finish Volume I by the end of February in order to catch up. So... we'll see how that goes. The challenge goes until the end of 2011. I just keep repeating "I think I can, I think I can, I think I can..." I'm the little bookworm that could. I can do this. Well, it's the middle of February and I'm still hanging in there with W&P. I have to say that chapter-a-day is probably the only way I'd be able to do it. Bibliophiles everywhere are cringing right now, I'm sure, LOL. So cool that you read Enough about Love! I just picked it up last week to buy but I saw that my boss moved it to her pile to read. Huh. She must not have realized it was for me. I'll wait for your review and see if it's one to buy... I can't help but want to buy it based on the cover alone, the design and feel! Mary - It's looking like it will be more than a chapter a day just for me to catch up at this point! Steph - I'm really enjoying it, although it's full of unfaithful husbands and wives. It's the kind of book that crawls into your head and won't go away, I think, the kind that makes you think, "Could I ever be like this?" while desperately hoping the answer is no. But then, the characters aren't so unlikable, after all. Anyway, it's very good, very French (in a good way). I just hope I can finish tonight and get the review up this week! I look forward to reading your review; hoping for something you can take away from it, something that explores the unfaithfulness but comes to some satisfying, even if only that it is thought-provoking, conclusion. I studied abroad in Paris! It's always fun to revisit in the books I'm reading. Makes me miss it, though.